The AD-AS model can be used to illustrate both Say’s law that supply creates its own demand and Keynes’ law that demand creates its own supply. 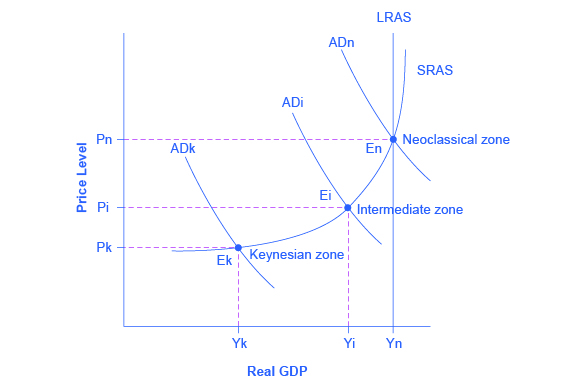 Consider the three zones of the SRAS curve as identified in Figure 1: the Keynesian zone, the neoclassical zone, and the intermediate zone. Figure 1. Keynes, Neoclassical, and Intermediate Zones in the Aggregate Supply Curve. Near the equilibrium Ek, in the Keynesian zone at the far left of the SRAS curve, small shifts in AD, either to the right or the left, will affect the output level Yk, but will not much affect the price level. In the Keynesian zone, AD largely determines the quantity of output. Near the equilibrium En, in the neoclassical zone at the far right of the SRAS curve, small shifts in AD, either to the right or the left, will have relatively little effect on the output level Yn, but instead will have a greater effect on the price level. In the neoclassical zone, the near-vertical SRAS curve close to the level of potential GDP largely determines the quantity of output. In the intermediate zone around equilibrium Ei, movement in AD to the right will increase both the output level and the price level, while a movement in AD to the left would decrease both the output level and the price level. Focus first on the Keynesian zone, that portion of the SRAS curve on the far left which is relatively flat. If the AD curve crosses this portion of the SRAS curve at an equilibrium point like Ek, then certain statements about the economic situation will follow. In the Keynesian zone, the equilibrium level of real GDP is far below potential GDP, the economy is in recession, and cyclical unemployment is high. If aggregate demand shifted to the right or left in the Keynesian zone, it will determine the resulting level of output (and thus unemployment). However, inflationary price pressure is not much of a worry in the Keynesian zone, since the price level does not vary much in this zone. Now, focus your attention on the neoclassical zone of the SRAS curve, which is the near-vertical portion on the right-hand side. If the AD curve crosses this portion of the SRAS curve at an equilibrium point like En where output is at or near potential GDP, then the size of potential GDP pretty much determines the level of output in the economy. Since the equilibrium is near potential GDP, cyclical unemployment is low in this economy, although structural unemployment may remain an issue. In the neoclassical zone, shifts of aggregate demand to the right or the left have little effect on the level of output or employment. The only way to increase the size of the real GDP in the neoclassical zone is for AS to shift to the right. However, shifts in AD in the neoclassical zone will create pressures to change the price level. Finally, consider the intermediate zone of the SRAS curve in Figure 1. If the AD curve crosses this portion of the SRAS curve at an equilibrium point like Ei, then we might expect unemployment and inflation to move in opposing directions. For instance, a shift of AD to the right will move output closer to potential GDP and thus reduce unemployment, but will also lead to a higher price level and upward pressure on inflation. Conversely, a shift of AD to the left will move output further from potential GDP and raise unemployment, but will also lead to a lower price level and downward pressure on inflation. This approach of dividing the SRAS curve into different zones works as a diagnostic test that can be applied to an economy, like a doctor checking a patient for symptoms. First, figure out what zone the economy is in and then the economic issues, tradeoffs, and policy choices will be clarified. Some economists believe that the economy is strongly predisposed to be in one zone or another. Thus, hard-line Keynesian economists believe that the economies are in the Keynesian zone most of the time, and so they view the neoclassical zone as a theoretical abstraction. Conversely, hard-line neoclassical economists argue that economies are in the neoclassical zone most of the time and that the Keynesian zone is a distraction. Later modules on the Keynesian perspective and the neoclassical perspective should help to clarify the underpinnings and consequences of these contrasting views of the macroeconomy. Watch this video for further clarification about the three different types of aggregate supply curves. Each AS curve, or model, is accurate in describing the economy at different points in time. For even more practice at analyzing the graph and considering the differences between the neoclassical and Keynesian models, watch this video. The SRAS curve can be divided into three zones. Keynes’ law says demand creates its own supply, so that changes in aggregate demand cause changes in real GDP and employment. Keynes’ law can be shown on the horizontal Keynesian zone of the aggregate supply curve. The Keynesian zone occurs at the left of the SRAS curve where it is fairly flat, so movements in AD will affect output, but have little effect on the price level. Say’s law says supply creates its own demand. Changes in aggregate demand have no effect on real GDP and employment, only on the price level. Say’s law can be shown on the vertical neoclassical zone of the aggregate supply curve. The neoclassical zone occurs at the right of the SRAS curve where it is fairly vertical, and so movements in AD will affect the price level, but have little impact on output. The intermediate zone in the middle of the SRAS curve is upward-sloping, so a rise in AD will cause higher output and price level, while a fall in AD will lead to a lower output and price level.